² Oops! Looks like someone's a little cheaper! Oops - we don't appear to have a video for the PS506U. The SmartOffice PS506U features one of the most advanced document feeding and separation system in the industry. 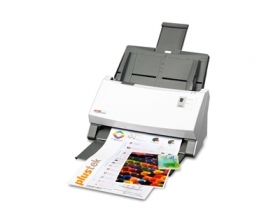 This system allows the SmartOffice PS506U to scan mixed batches of varying paper sizes and weights. Able to handle everything from business cards to rigid ID cards and documents, the SmartOffice PS506U easily scans both sides of one sheet in just one pass. The automatic document feeder (ADF) is also robust enough to feed up to three hard cards continuously or an embossed card up to 1.2 mm in thickness. Create searchable PDFs at the touch of a button. Single Touch scanning allows you to define 9 different scanning functions that can all be accessed by simply pressing a button. In addition to Searchable PDF, you can transform your paper documents into editable Microsoft Office document formats or common image formats such as JPG and TIFF. Industry standard TWAIN, ISIS and WIA drivers ensure compatibility with thousands of image enabled applications. The 100 sheet feed tray along with a daily duty cycle of 6000 pages means that the SmartOffice PS506U is a scanner that is designed to scan documents every day, all day long. Turn the ultrasonic sensor on to prevent double feeding of original documents during scanning, and off when scanning document with labels, sticky notes, or taped receipts. This innovative design prevents double feeding and effectively scans documents of different weights or thickness. Thanks to double-feed prevention, optimum reliability is assured even when scanning high volumes of documents. The SmartOffice PS506U is environmentally responsible and easy to use at the same time thanks to its ENERY STAR certification, low power LED illumination technology and power-saving function. The SmartOffice PS506U also features auto wake up that enables users to simply place the paper in the scanner and wake up the scanner from sleep / stand-by mode.